One of the reasons that piano genres like jazz, R&B, funk and gospel sound like they do is due to piano voicings. Voicings are the way the notes of a given chord are arranged. For example, a C-major seventh chord comes from the C-major scale and contains the root (C), the third (E), the fifth (G), and seventh (B) of the C major scale. 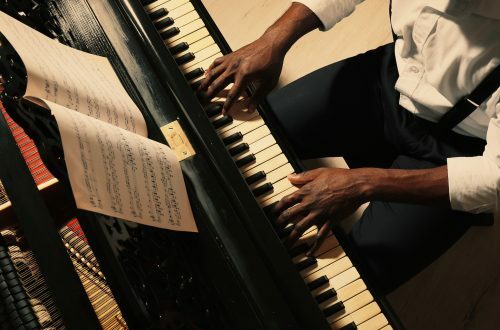 However, instead of playing the notes in that order (C, E, G, B), a pianist might just play the seventh (B), root (C) and third (E) of the chord (spelling the chord from the bottom to the top). This voicing omits the fifth of the chord, inverts the other chord tones to create a certain sound. Play this voicing now. Each of the genres I mentioned before have between three and five standard, “go-to” voicings. When we multiply that number by the number of chord qualities: major, minor, dominant, altered dominants, minor-seven-flat-fives and multiply that number by twelve (the number of major keys), we end up with quite a few voicings to learn. Of course, learning the voicings is not even the hard part, especially for a pianist with a little understanding of music theory. The challenge comes up when we try to recall the voicings and use them on a lead sheet or in a jam session. In this article, I will show you a way to quickly learn piano voicings and have the ability to recall the right voicing at the right time. For this example, you can use the major seventh voicing I spelled out earlier, B-C-E or, you can use any voicing of your choosing. This system works for all voicings. To begin, sit at the piano and clear your mind. Quieting the chatter, take two or three deep breaths. Play your voicing. As you do this, relax, hold the notes and let them ring. Then, let go of the keyboard. Place your hands in your lap. Using the same notes in the same register, repeat the process again: breathe, play, hold, relax, let go. Now, close your eyes and picture the keys you just played in your mind. See the letter names of the notes in your mind’s eye and then say the letter names aloud. Play the voicing again. As you hold the notes, sing them from the bottom to the top. Sing the B, then the C then the E. If you need help finding or checking the pitches, play them them individually. Continue this process for five minutes, even if you are tempted to move on. Remember: “Practice” is short for Practice-Doing-It-Right. After five minutes, take a break, come back, and play your new voicing. Repeat this process with one voicing at a time. After an hour, you will know that voicing in all twelve keys. When we learn to play the piano, using many different parts of our brain helps ensure that the information will always be there. I have found that the best way to learn voicings is simply relax and use different parts of the brain. This way we only have to learn them once.